YOG: Top-seeded Tomokazu Harimoto of Japan loses to Chuqin Wang of China in the Finals; India's Manav Thakkar bows out disappointingly. Table Tennis event wound up at the Technopolis Park in Buenos Aires, Argentina. China who were aiming for a repeat performance of Nanjing 2014, would need to put in a spirited performance to regain the crown. Japan’s Tomokazu Harimoto is the top seed after becoming the youngest ITTF men’s singles winner, clinching the Czech Open at the age of 14. With wins over world No.1 Fan Zhendong, Ma Long and Timo Boll he is a strong competitor to upset the Chinese bandwagon. Kanak Jha, of USA, is the second seed; Sixth seed Chuqin Wang of China with a world ranking of 105. 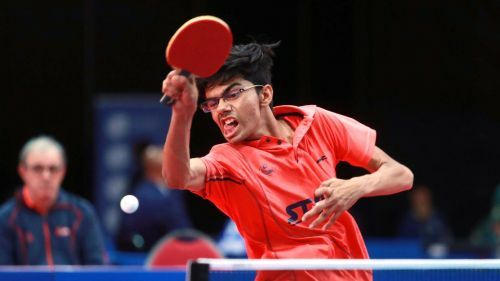 India's young teenage sensation Manav Vikash Thakkar is seeded fifth with a world ranking of 218. Manav had a great start to his campaign to maintain his stronghold over the Lithuanian in the head to heads. After winning a tight opening game, he lost the second and fourth games. He dominated the fifth and sixth games to clinch his first victory. Thakkar looked out of sorts against an attacking Ahmadian, powering his way past the Indian with booming forehand winners. The Indian seemed thoroughly unsettled as the Iranian won the match comfortably. The loss signified a second place in the group for Thakkar, which places him with a tricky opponent in the knockouts. Thakkar showed glimpses of his brilliance in his victory over the Malaysian. He needs to play consistently better in the knock-out stages if he plans to pose a challenge for the medals. After a comfortable first set, he lost the second and the fifth game to Choong, before winning the sixth to enter the knockouts. In their first ever encounter between the two, Harimoto established his class after dropping the first game to the Indian. Tomokazu Harimoto’s experience saw him through against Thakkar as the Japanese overcame the mistakes he made in the first few games to overhaul the Indian. Harimoto won an incredible 27 points from his service. Wang Chuqin’s backhand proved severe as the Chinese rode on his confidence to overcome Kanak Jha. Wang dominated with big leads of seven points in games three and four. Though Kanak Jha lost the match, he went on to become the first player from the United States to reach the Men’s Singles semi-final. Lin Yun-Yu created problems with subtle service variations to seize the opening game. Tomokazu Harimoto earned close victories in the second and third games, after securing the fourth with ease. Trailing 5-2 in the fifth, Lin Yun-Ju took a time-out and responded brilliantly securing the next two games to force a decider; At the change of ends, Tomokazu Harimoto led 6-5 when he took a timeout to stall Lin's momentum to secure the final game. Lin Yun-Ju became the first Chinese Taipei player to reach the semi-finals of a major event. 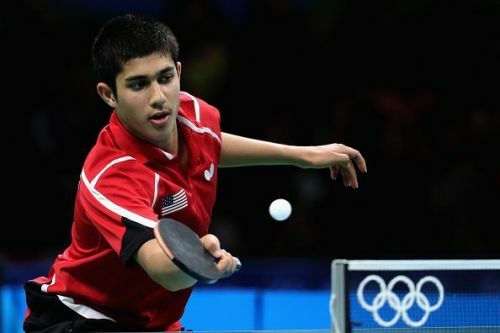 Kanak Jha of the United States secured the bronze medal after his victory over Chinese Taipei’s Lin Yun-Ju. Lin's electric forehand, dominated the proceedings to secure the first game. Jha responded well taking the second game and then squeezed past Lin to pocket the third. A forehand topspin down the line gave the American a comfortable three-game cushion over Lin. Lin was back in action with quick attacks to win the fifth and sixth games to force the decider. It was 9-9 in the decider when Kanak took the final two points to claim a thrilling victory. Kanak Jha stated to the media, "Lin Yun-Ju is a top player not just in juniors but also in the senior's category. The competition here is tough with so many top-level players competing, and am happy to win a medal." China’s Wang Chuqin conquered Tomokazu Harimoto with tactical precision, employing short service returns to Harimoto's forehand to secure the opening game. Adapting to the subtle variations, Harimoto sprung back to win the second game. 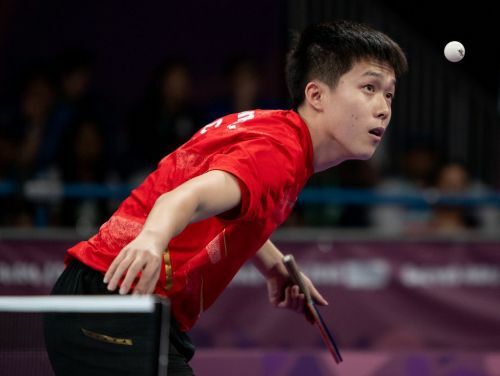 In a display of true sportsmanship, Wang Chuqin won the first ten points of the third game before he deliberately served the ball into the net to hand Harimoto a point. The Japanese failed to return the next service to complement Wang for his sporting gesture. In the fourth game, Tomokazu Harimoto squandered a game point at 11-10. The Chinese capitalized on the mistake winning the next three points to clinch the game. Tomokazu Harimoto was never able to extend the advantage. as Wang Chuqin took full advantage of his service to secure the Gold. South Korea's Cho Daeseong seeded 29th in the competition, beat Thailand’s Yanapong Panagitgun, the no.13 seed, 4-0 (11-5, 11-7, 11-8, 11-6). Jann Mari Nayre of the Philippines, the no.31 seed, accounted for Chile’s Nicolas Burgos, the no.14 seed, 4-1 (11-9, 6-11, 11-9, 11-6, 11-8). Host nation’s Martin Bentancor, the no.20 seed, lost to North Korea’s Kim Song Gun, the no.32 seed 0-4 (9-11, 8-11, 9-11, 9-11). Russia’s Vladimir Sidorenko the no.19 seed, got past Thailand’s Yanapong Panagitgun, the no.13 seed, 4-0 (11-3, 11-7, 11-9, 11-4). China's Wang Chuqin beat Sweden’s Truls Moregard, the no.3 seed, in five games 4-1 (11-6, 11-9, 10-12, 11-9, 11-9).